There are weekly assignments. We strongly discourage you from copying solutions of your fellow students since you’re depriving yourself of the experience of learning how to solve the problems on your own. In particular you won’t learn useful things for the exams and projects this way. Or for that matter, from the course. If we see brazen plagiarism we will deal with it. That said, you should discuss the problems and solutions with others. You will likely benefit from that. First create a Github repo, e.g. https://github.com/mli/berkeley-stat-157. 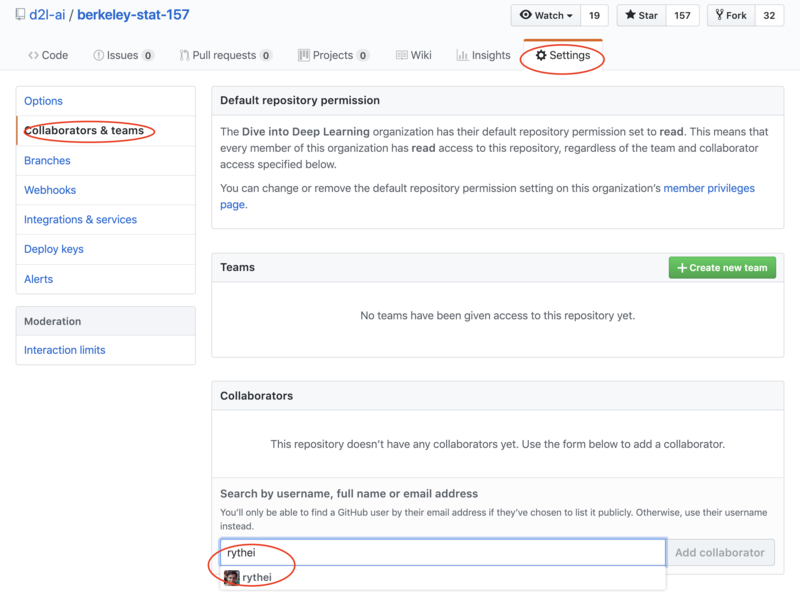 You may want to make it private (Github now offers unlimited private repos). Email your repo URL to berkeley-stat-157@googlegroups.com with your name and SID. And also add Ryan (Github ID rythei) as a collabrator to your repo. You can do it through Setting -> Collabrators & teams -> Collaborators. (Check this screen shot). Save the homework notebook in your root directory of your repo. Before pushing, please make sure run all cells and save it with outputs, i.e. 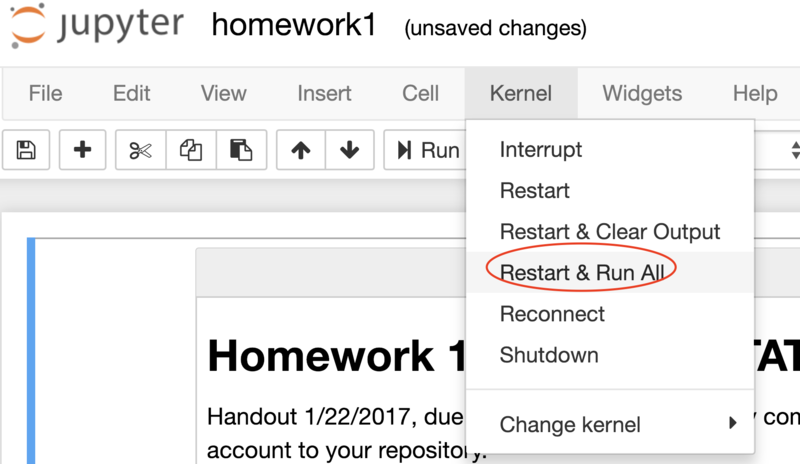 click Kernel -> Restart & Run All in Jupyter notebook, then save. (Check this screen shot). Assignments are due by 4pm on the Tuesday. Please upload your homework to Github before that time. You can either use git push or click the “Upload files” on Github. As we proceed, we’ll be filling in details. In terms of solutions we’ll take the liberty to reuse some of your submissions as reference solutions (unless you tell us otherwise). The 9 best out of 10 homeworks count. That is, you can skip one homework or you can simply do them all and we’ll only count the 9 best ones. Beyond that, you can be late once for two days, i.e. you can submit one home work on a Thursday by the end of the class. We will make the homeworks available online the day the previous homework is due, possibly earlier (some finetuning is required since we need to ensure that we’ll cover the content of the homework in the class). The TAs will return the graded homework within 2 weeks of submission. Overall, homeworks are worth 30% of the overall scores.